Eco-BeddingTM is 100% recycled paper. The unique and patented process of cutting and folding paper strips makes for an excellent bedding material. Eco-BeddingTM is highly absorbent, easily compostable, and completely dust free, solving the problem of inhalant irritations or allergies. Labor savings. Since Eco-bed/nest absorbs from the bottom up, the top layer stays dry longer and animals are always on a dry surface. East to spot clean. Eco-bed/nest extends bedding changes from every two to three days to a week or more. Eco-bed/nest holds up to 3.1 times its weight in water. Dust elimination. Eco-bed/nest is made of cleanly cut 1/8-inch strips of paper fibers, which means dust is virtually eliminated. 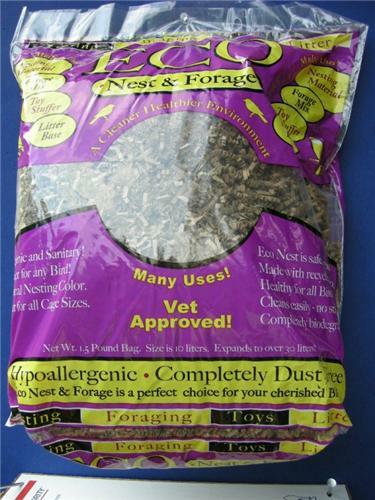 Respiratory ailments and other problems resulting from airborne particles are drastically reduced which is important for animals or birds with sensitive respiratory systems. Hypoallergenic. Great for Asthma & Allergy sufferers (people, animals, and birds). Maximum animal comfort. The paper strands form a soft, springy, comfortable mat. The bedding in contact with the animal stays dry, as well, for added comfort. Plus, unlike wood-based beddings, Eco-bed/nest won't stick to the animals. Environmental enrichment. Can be used as a top layer on other beddings that pack down (shavings, pellets, etc.) because Eco-bed/nest stays "fluffed-up". Also, animals can burrow and tunnel in it. Safety Tested & Non-Toxic. Safe for breeding animals and birds, and is not a choking hazard. Consistent quality. Unlike harvested beddings such as wood and straw, Eco-bed/nest is a controlled, manufactured product made up of 100% recycled paper fibers to ensure consistent, high quality. Improved air handling. Elimination of airborne dust means fewer particles to filter and control, resulting in fewer filter changes. Nesting additive. Eco-bed/nest appeals to rodents' and birds' urge to build nests. Expands. a little goes a long way. Easy disposal. Because Eco-bed/nest is a paper product, it can be flushed or trashed for easy, economical disposal. Eco-bedding is 100% Recyclable and Biodegradable.